This Thanksgiving, pay it forward with a Delicious Orchards pie…or a flock of geese…or a camel. I’m still in a warm and fuzzy half-life mood since my outing to Ichiban on Wednesday (see my previous post about our amazing pre-Thanksgiving maki miracle). Simple human kindness can really stem from any number of ways. This week I’ve been paying a little more attention….holding doors for people…actually remembering to send birthday cards (I’m really terrible at this…and usually realize until it’s way to late to even send a belated birthday card)…surprising a random someone with a coffee treat at Starbucks Coffee during the Starbucks Buy One Get One coffee event (ends tomorrow 11/21). I wouldn’t say that I’ve had a total holiday epiphany (I won’t be serving Who-Hash to little Cindy Hoo-Hoo in Who-ville while wearing a Santa hat anytime soon…I’ve always been a little “Grinch-y” about the holidays). But I have remembered that there is kindness in the world, and I’m trying to keep that cycle going a little bit. And the holiday season seems so apropos for this sentiment. I am still inspired to “pay it forward”. If you are inclined to do the same, I have a couple good suggestions. 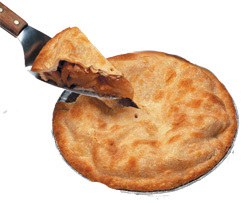 This is a picture of an actual apple pie from The D.O. Most awesome pie. Ever. Since this is a blog about New Jersey, I would be remiss if I did not mention Delicious Orchards of Colts Neck, NJ (known around these parts as The D.O.) Besides from having some of the best produce and apple cider within a 50 mile radius, The D.O. is well known for its scrumptious bakery department. Delicious Orchards bakes one of the best apple pies I have ever tasted. Period. And apparently, it seems that most of New Jersey thinks so, too. From the week before Thanksgiving thru Christmas, Delicious Orchards has to hire the Colts Neck cops to keep the traffic running smoothly on Highway 34. Housewives have been known to knock each other out with their massive Louis Vuitton overnight bags purses to get to the last pie. However, you don’t have to experience the madness firsthand at The D.O. Delicious Orchards does have an online store where you can have one of their famous pies or fruit/bakery baskets shipped anywhere in the country. Think how surprised a long lost relative would be if they received one of these packages at their doorstep. Or find out from your church or synagogue if there is a family in need who certainly would appreciate the gift. It can be anonymous or not…whatever makes you feel good about your Pay It Forward moment. Donate a llama. Because what the hell are you going to do with another set of Bath & Body Works bath gel? Pay it Forward on a global scale. A good friend of mine recently got married this year, and asked that in lieu of wedding gifts, that instead a donation be made to Heifer International , which is a non-profit that seeks to empower those people by giving them agricultural gifts that help sustain their foodstuff supplies and foster independence. 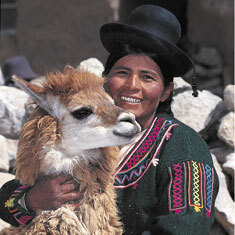 I thought it was kind of cool that I gave a llama…I was intrigued that llama droppings help fertilize topsoil in a low-pasture area, and that their fleece can be woven into blankets, clothing for a village’s personal use, or as a fair-trade export product. Much more meaningful than that panini maker, right? A gift of $10.00 can buy a partial share in a gift of rabbits, pigs, and sheep. A gift of $20.00 can buy a flock of geese. ducks or chicks. Of course, there are monetary gifting levels that can buy whole animals or livestock development programs, but any donation truly does make a difference. Sorry to go all “Sally Struthers” on you. However, I do feel that especially this time of year, we do have a LOT to be thankful for – family , friends, health, a roof over our head, and the ability to take it for granted when we go into a supermarket. I’m hoping to keep this trend going. As a relatively new blogger, I would love to hear about your Pay It Forward moments. When we reach 10 comments from 10 different readers, I will match my existing Heifer International pledge…so I will be doubling my gift. Thanks so much, readers! I just love the comment about the birthday card thing. I got a “belated” birthday card for my niece and waited 2 months b4 I thought about mailing it. I just ended up tearing it up.